Can you launch and not tell us what it is? 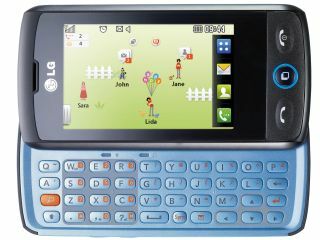 LG has announced its Windows Mobile roadmap, promising 13 new mobiles by the end of 2010. As part of the announcement, LG has promised three new imminent devices, but in the press release didn't give any information, only stating they would be a full touchscreen device, a touch slider with QWERTY keyboard and a QWERTY bar-type handset. However, in the corner a picture of the GW550, the bar-type device, is revealed as one of the first three. It's the company's first bar smartphone, which is mostly down to not having a huge amount of smartphones thus far anyway. The new phones will all be released on Windows Mobile 6.5 (and probably Windows 7 as it appears) and will be skinned with LG's S-Class system. "This initial launch is a strong testament that LG is committed to offering a spectrum of choices for our broad range of customers," said Dr. Skott Ahn, President and CEO of LG Mobile. "Our work with Microsoft on mobile devices reflects our strategy of offering the best in both hardware and software in all our smartphones." Apparently the three new phones will be released to early adopters in Asia, Europe and the US, although there's no word on an actual release date, price, model number... or pretty much anything else. Still, it's not like all your other competitors are releasing a slew of new phones or anything, eh LG?